Fainting, also known as syncope, is a sudden loss of consciousness caused by reduced blood flow to the brain. A faint can often result in a fall or a loss of posture which can potentially be dangerous in some circumstances. Fainting is different from other causes for loss of consciousness, such as a seizure and normally a person will only be unconscious for a moment or two after fainting. Fainting is a common occurrence; it is thought that one in four people will faint at least once during their lifetime but many people will experience it much more than that. Girls have a higher risk of fainting than boys. The main cause of fainting is due to a reduction in blood travelling to the brain. Blood flow in the body is regulated by the autonomic nervous system. Normally the blood travelling to the brain is monitored and any anomalies are corrected before it becomes significantly lower than normal. However, it is not always possible for the nervous system to regulate malfunctions. A decrease in the blood travelling to the brain can be caused by many factors. Often people faint from external factors such as pain or an unpleasant sight; many people commonly faint from the sight of blood for instance. In these situations, the autonomic nervous system is temporarily affected by the brain, causing a decrease in the blood flow. Fainting may be caused by hunger or tiredness while heat can also be an issue. Fainting can also be caused by emotional trauma; it is not uncommon for people to faint after receiving bad news. Faints can also be caused from standing for a long period of time or by standing up quickly; this can impact on the veins of the body and cause a decrease in blood pressure. Often multiple factors will contribute at once. It is not uncommon to see a member of a wedding party faint at the altar, often from a combination of heightened emotions, heat, drinking and standing still for a prolonged length of time. Fainting can also be triggered by a number of health conditions. Common causes of fainting include low blood sugar, diabetes, anemia, irregular heartbeats and panic attacks. Alcohol or drugs may cause a decrease in blood flow to the brain. In rare cases, fainting can even be triggered by laughing or coughing. For many, the early warning signs of a faint are brief and vary from person to person which makes it hard to spot early. Common early symptoms though include feeling clammy, dizzy and nauseous. Breathing can become faster and it is common to feel lightheaded. Reduced blood flow to the brain can cause your vision to be affected, with many people experiencing blurred vision or blind spots, or often a feeling of their vision being blacked out or being encroached/going fuzzy. Many people also experience a ringing or roaring sensation in the ears. If you fulfill any of the risk factors for fainting and especially if you are hot, inebriated or tired or have been standing for long periods of time, you should respond to these symptoms by sitting down to avoid a fall. If you are with someone who starts to feel faint (and you may also notice them losing color), encourage them to lie down. Ideally, encourage them to lie with their legs raised above the level of their head; this will help to regulate their blood flow and ensure that enough blood is travelling to the brain. Alternatively, they may prefer sitting more upright with their head between their knees. This position will have the same effect. If you are with someone who has just fainted, position their legs higher than their head, perhaps by balancing their legs on a chair. Loosening any tight clothing or belts and collars will help. Normally a person will only be unconscious for a few seconds or for a moment. Once they have regained consciousness they may feel confused, disorientated or tired; you may need to stay with them to assist them while they recover. Offering a drink of water will help the recovery process as can providing a tea with a spoonful of sugar – tea is a vasoconstrictor which can marginally increase blood pressure and the sugar can replace lost blood sugar. If they have sweated a lot, then giving them something salty can also be helpful. If the person fainting has been unconscious for more than two minutes put them into the recovery position and call for an ambulance. 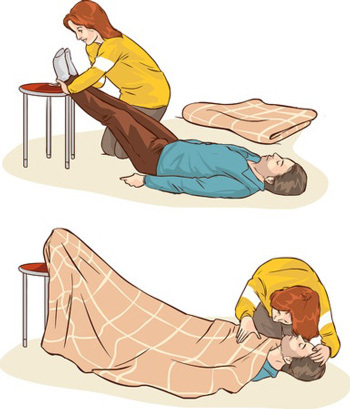 While waiting for help to arrive, closely monitor their breathing and their pulse. The medical team will be able to organize their treatment when they arrive.